This Complete Street Legal Light Kit is designed specifically for gas and electric Club Car Precedent golf carts. It has absolutely everything you need to legally drive your Club Car on the street at dawn, dusk or even when it's darker than dark outside! Fits EZGO TXT Golf Carts. LED red taillights for energy-saving and durability. New and improved wiring connectors. 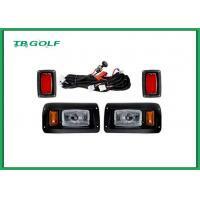 Golf cart light bar kit - offers everything you need to drive at night - headlight bar & taillights, wiring harness and an on/off switch.